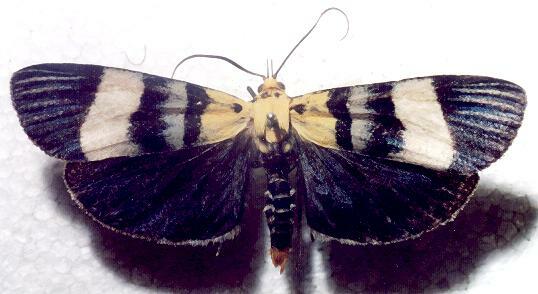 These moths have forewings that are white, with a series black stripes at the margin, and with two black transverse bands. The outer black band has a pale blue spot. The area between the hind band and the thorax is yellow, The thorax itself is also yellow with two black spots. 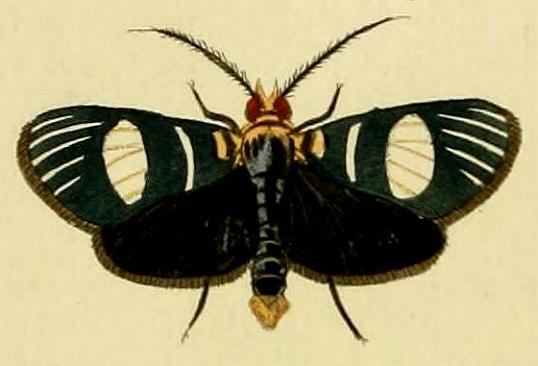 The hindwings are plain black. There is also have a yellow brush of hairs at the tip of the abdomen. 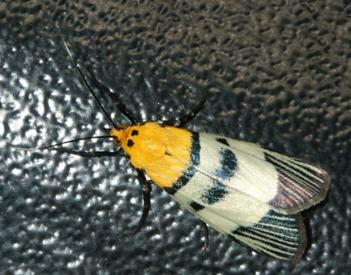 The moths have a wingspan of about 5 cms. image courtesy of Biodiversity Heritage Library, digitized by Smithsonian Libraries. LeapFrogOz, Kuranda, 2008, p. 28. LeapFrogOz, Kuranda, 2015, p. 189. Volume 4 (1781), pp. 149-150, and also Plate 367, fig. I.
CSIRO Publishing, 2007, p. 132.